The Pens lost a doozy in this one. And by doozy I mean they had their chances just didn't capitalize. 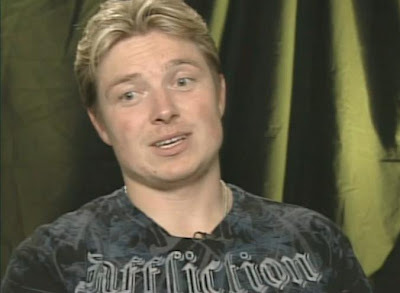 Kane, Towes, Hossa, Keith...none of them really showed me anything that is cause for concern for the Pens. They are perhaps the best in the West though. 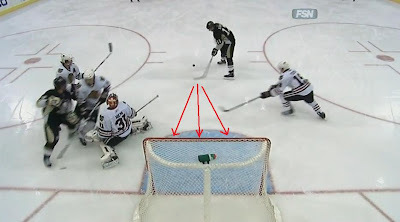 Sure Hossa had a goal, but it was what we call in NHL10, a cheese goal. Niemi was solid, nothing taken from him. But ultimately the Pens had to many missed opportunities and that resulted in the loss. Did I mention Sid was out? A fair amount of excitement to start the game. 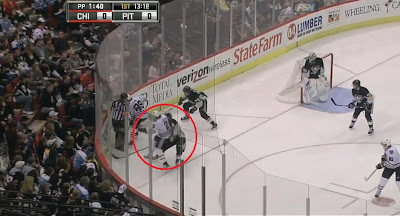 Cooke went out with the first penalty of the game for deciding it was okay to check someone from behind who doesn't have the puck. Pens killed it. 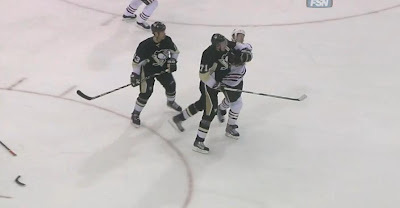 Then Orpik headed to the box for holding Versteeg. Penalty killed for the first 20 seconds. 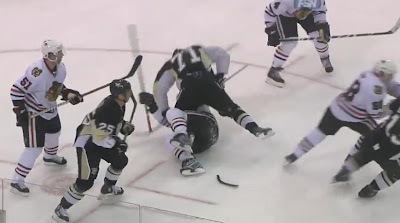 That was until Duncan Keith decided to go headhunting on Cooke for a hit just a few seconds earlier. He only gets 2 minutes...in this game anyway. After the dust settled a little bit Malkin joined the hitting game and dropped Seabrook and had a nice chance only to be stoned by Niemi. Sadly it was Hossa who got the Hawks on the board first. He followed on a rebound off a slapper from Campbell, [0-1]. Still hate him. 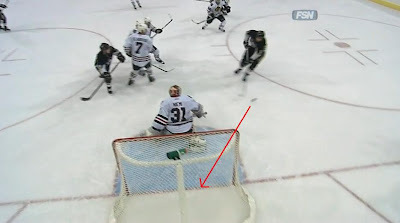 I typically don't post pics of the opponents goals, but look at this effort from Fleury. We saw a couple good scuffles as the period went on. Rupp got tangled up with some schmohawks, so did Godawful. Cooke tried everything he could to get Keith to tangle, but he backed out like Peter Griffin after he realized he wasn't gay. Strong period for the Hawks, Niemi was huge. Crosby out of the line up resulted in an 18-8 faceoff deficit. Pretty much at this point the Pens played their game. They took control of the next two periods and went to town. You wouldn't know it from the scoreboard, but they essentially raped the Hawks for the next 20 minutes. 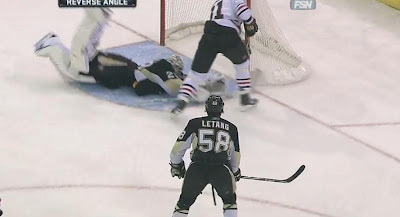 The Pens oushot the Hawks 17-6 and it just looked like a matter of time before they found the back of the net. Letestu was huge tonight. He's NHL ready, unlike Jerk Store who's barely AHL ready. Letestu was quick on the draw and won 9 out of 16 faceoffs as well. He has like three passes that made newly acquired writer Oz cry. Particularly the feed to Gonch who gets robbed by Niemi. One high point of the period was Geno's altercation with Fraser. They tangle in the faceoff only for Fraser to subsequently lose the draw, fall, and drag Geno down with him and hold his stick. Behold. Geno did get the last laugh, or should I say elbow to the head. Geno drops Fraser. After that, period ended. Nothing fancy to talk about. Hawks still up 0-1. 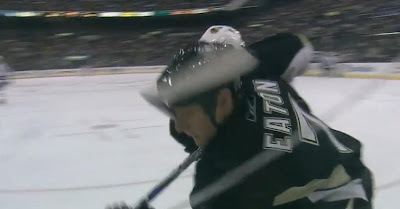 Oh, evidentally the refs don't know what highsticking is. Really a pretty even period despite the Hawks having more shots on goal. The Pens did in fact have better scoring chances and opportunities I felt. And despite the emotions and intensity from the previous periods there were no penalties this period either. The two notables of the period invovled our very own Jordan Staal. First he disappointed us but later he redeemed himself. The second, he ties it up from after Fleury's left the net and Yeo draws up a nice play...for once, [1-1].